The preferences dialog can be accessed via the Help >> Preferences or the File >> Preferences menus. The dialog contains an "Information" column and a "Configure" column (see image below). All items in the "Configure" column are configurable with TAlh command line switches. The command line settings may be overridden with this dialog for the duration of the TAlh session. If this preference is selected, the alarm acknowledge dialog is displayed below the hierarchy pane. Otherwise, the alarm acknowledge dialog is shown in a pop-up window. Note that only the last selected alarm/monitor is shown. Note that the dialogs for viewing alarm configuration details and modifying alarm configuration details are always shown as a pop-up. This preference enables/disables the acknowledging of alarm groups, i.e. acknowledging all alarms in a group with one button press. This preference check-box is only enabled if the alarm configuration file does not forbid acknowledging of alarm groups. Note: This preference applies only when in-line acknowledging of alarms is not selected. 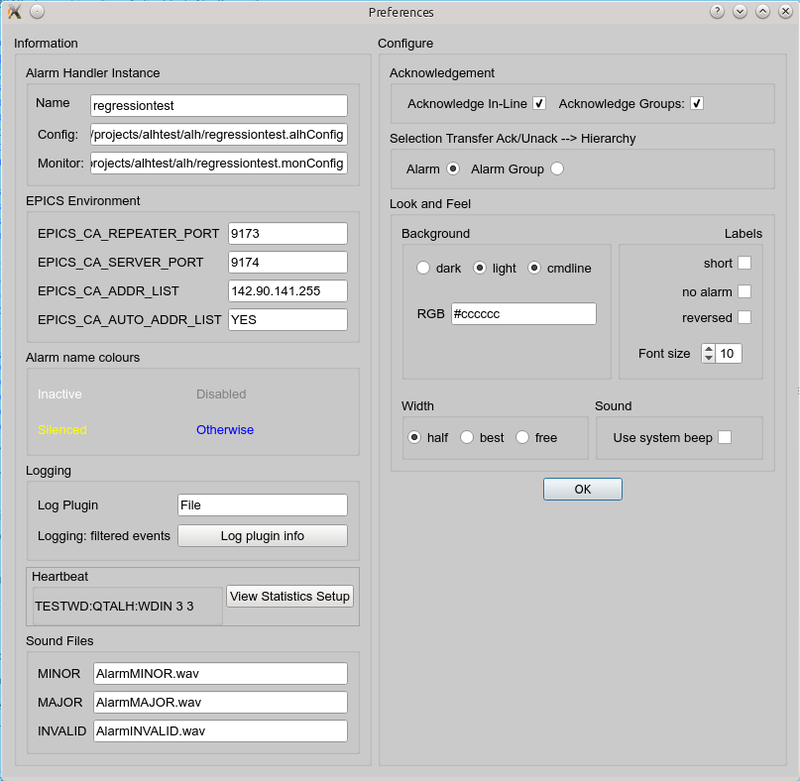 If this preference is set to "Alarm" and an alarm is selected in the Ack frame or Unack frame, the alarm's containing alarm group is opened in the hierarchy pane and the alarm is selected. If this preference is set to "Alarm Group" and an alarm is selected in the Ack frame or Unack frame, the alarm's containing alarm group is opened in the hierarchy pane and the alarm group is selected. If this preference is set to "half" TAlh attempts to set the main window width to half the width of a monitor. If this preference is set to "best" TAlh attempts to select an optimal width for the main window. If this preference is set to "free" TAlh attempts to select an optimal width for the main window. Afterwards the window is freely resizable.